The shared water tower field in Waveny Park has both soccer and football equipment. Meeting minutes, use of sports fields and official procedure comprise one overlooked event of the July 18 Town Council meeting. The final item on the agenda that night was a revision of the minutes from the May 20, 2009, meeting. In these minutes, then-secretary Tom O'Dea (R) added a sentence stating that the New Canaan Youth Football program would cover any cost overruns for the field "in exchange for the exclusive use of the Water Tower gurf (grassy turf) and grass fields from mid-August until the weekend before Thanksgiving." Upon review of an audio recording of the meeting, such a statement never was made at the meeting, though O'Dea insists it was said at some point, possibly in the approval of the minutes of the meeting. At the July 18 meeting, O'Dea asked fellow Town Council member Christine Hussey (D) whether she remembered the statement. According to the video of that meeting, although she did not have a microphone on, she did not object to O'Dea's recollection. The minutes were revised to delete the sentence in question from the record. O'Dea recused himself from the vote to change the minutes, as his children play in the football program and he is a coach. Current council members Joe Paladino, Roger Williams and John Emert recused themselves as well, because they did not sit on the council in 2009. Although O'Dea had recused himself from the May 20, 2009, meeting, as secretary he was charged with compiling the minutes. At the July 18 meeting, O'Dea said there was a backlog in the compilation of the minutes during 2009. O'Dea said the backlog occurred when the town stenographer, who usually takes notes during the meetings and sends them to the secretary afterward, stopped emailing him. When the minutes stopped coming in, he had to catch up on recording them himself. "My mistake, but I was waiting for the minutes to be emailed to me," O'Dea said. "After several months it became readily apparent they weren't coming in so I had to re-create the minutes using tape and my notes. Generally, I thought my notes were pretty good. Clearly, they weren't good enough because there was a problem with the football minutes." The Freedom of Information Act requires public bodies to submit draft minutes to the Town Clerk within seven days of the meeting. O'Dea said draft minutes were not submitted on time during most of his tenure as secretary, adding that he would submit them in bunches once he caught up. Such group approvals of official minutes occurred during O'Dea's term as secretary at the Aug. 26, 2009, Town Council special meeting, where the minutes of Feb. 18, March 5, 11, 18 and 24 were approved, and at the Sept. 16, 2009, regular meeting, where the minutes of April 7, 22, July 15, 22 and 23 were approved, as well as at meetings after Council member Kit Devereaux (D) became secretary. O'Dea added that, "I had no desire to be secretary. I agreed reluctantly." Not everyone on Council was satisfied that all was made right by the revision of the minutes. Last week, Council member Roger Williams (R) included the issue as one part of his reason to withdraw his support for O'Dea's candidacy for the 125th General Assembly District. "Mr. O'Dea recorded in those minutes a benefit to a youth athletic group that he was involved in, a benefit that was never discussed by the council ... In reflection of Mr. O'Dea's conduct that evening I have no choice but to withdraw my endorsement of his candidacy." O'Dea claims that this is really not an issue. "I readily admit I made a mistake about those minutes, but I know I had that exchange with Chris Hussey. Roger originally said it wasn't a problem, no one benefited with it. Now he's bringing it up because he's mad at me [over the pension vote]. It's a red herring." Hussey did not return calls for comment. The New Canaan Youth Football program raised more than $90,000 to have the lights installed in the field (along with New Canaan Lacrosse, which raised more than $50,000 but plays in a different season). It was also noted at the July 18 meeting that Town Council has no jurisdiction over which teams get playing time; Steve Benko, director of recreation, makes that call. Also at the July 18 meeting, Town Council Chairman Mark DeWaele made the point that without the donations from the football team, there would be no lights and no extra field time. As such, he had it added to the minutes that the Council hopes that the Parks and Recreation Department considers that fact when assigning field time during the season. NCYF is growing, and in its meeting with the Parks and Recreation Department, program leaders mentioned that they had a claim to exclusive use of the fields during the night hours, referencing the minutes from the May 20, 2009, meeting, according to Bob Rogers, chairman of the Parks and Recreation Department. "That didn't make sense because we don't do that," Rogers said. So a member of Parks and Rec went back and found an audio recording of the meeting and discovered that such a clause was not mentioned on May 20. "Somehow it got written into the minutes, but it wasn't true," said Benko. Now that fall sports are starting, field time is hard to come by. "It's starting to be competitive to get field time," said Benko, listing the teams in need of a place to play: youth football; flag football; girls' field hockey; soccer; high school junior varsity football, adding, "The fields are going around the clock." Not posting minutes within seven days of a town meeting would not conform to the provisions of the Freedom of Information Act, according to Tom Hennick, Public Information Officer at the Connecticut Freedom of Information Commission. There are 30 days for someone to make a complaint about this statute being breached, which has now long since come and gone, so the late minutes from 2009 no longer constitutes an abridgment of the rules, Hennick said. Changing minutes from a previous meeting, after they have been approved, is rare but not unheard-of, according to DeWaele. "Examining prior minutes is not a frequent occurrence," he said in an email. "However, when clarification of an action taken by the Town Council is necessary, it is appropriate to have the Town Council review the minutes in question." 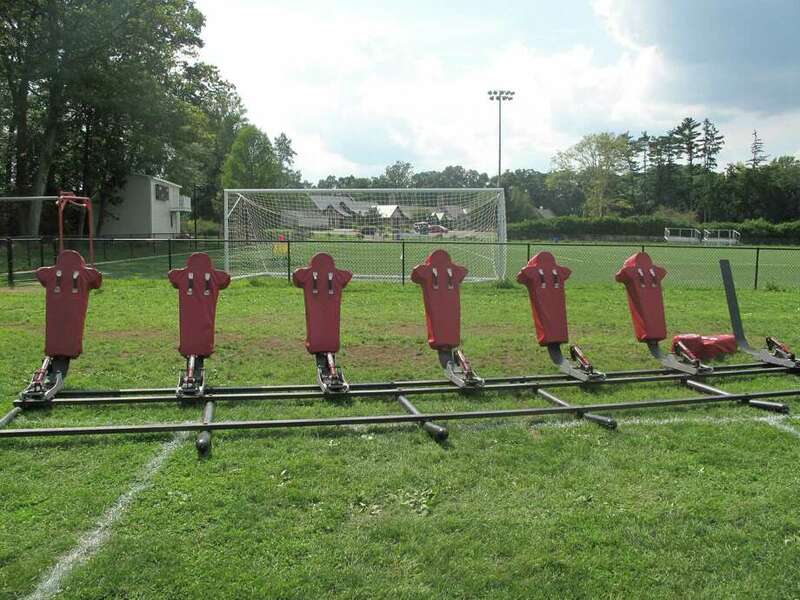 New Canaan Parks and Rec maintains that no sport or program can have exclusive use of any field, and that schedules are best constructed to suit every interest. This does not mean that each team gets equal use of the fields, however. "They did raise a majority of the money [for the lights]," Benko said.